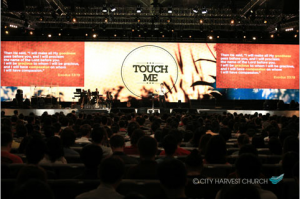 On the 21st April 2013, Sunday, I attended the City Harvest Church service at 10 am at Singapore Expo Hall 1. The service started with beautiful praise and Worship. The anointing was awesome during the worship. After Praise and Worship, Pastor Kong shared the sermon, quoting Ephesians 3:18-19. 18 May be able to comprehend with all saints what is the breadth, and length, and depth, and height; 19 And to know the love of Christ, which passeth knowledge, that ye might be filled with all the fulness of God. In the book of Exodus, we read that Moses life during the first 40 years was in the Palace, but during the next 40 years, he was a shepherd. He became nobody from somebody during his days as a shepherd. God loves to appear to a broken and contrite heart. Moses saw the bush burning with fire, without being consumed. Today you may feel the same. The divine presence of God keeps you from burning out. Now Moses kept the flock of Jethro his father in law, the priest of Midian: and he led the flock to the backside of the desert, and came to the mountain of God, even to Horeb. 2 And the angel of the Lord appeared unto him in a flame of fire out of the midst of a bush: and he looked, and, behold, the bush burned with fire, and the bush was not consumed. 3 And Moses said, I will now turn aside, and see this great sight, why the bush is not burnt. 4 And when the Lord saw that he turned aside to see, God called unto him out of the midst of the bush, and said, Moses, Moses. And he said, Here am I. 5 And he said, Draw not nigh hither: put off thy shoes from off thy feet, for the place whereon thou standest is holy ground. 6 Moreover he said, I am the God of thy father, the God of Abraham, the God of Isaac, and the God of Jacob. And Moses hid his face; for he was afraid to look upon God. 9 And he said, I will make all my goodness pass before thee, and I will proclaim the name of the Lord before thee; and will be gracious to whom I will be gracious, and will shew mercy on whom I will shew mercy. God showed Moses Goodness, Grace, Love ! Something always happens, when we touch God, said Pastor Kong. The second person is Joshua who removed his shoes, while entering into the Promise Land. All that the Israelites had were sling and trumpets. All of a sudden, Joshua saw the second person of Trinity with a sword in His hand. Joshua 5:13-15. 13 And it came to pass, when Joshua was by Jericho, that he lifted up his eyes and looked, and, behold, there stood a man over against him with his sword drawn in his hand: and Joshua went unto him, and said unto him, Art thou for us, or for our adversaries?14 And he said, Nay; but as captain of the host of the Lord am I now come. And Joshua fell on his face to the earth, and did worship, and said unto him, What saith my Lord unto his servant? 15 And the captain of the Lord’s host said unto Joshua, Loose thy shoe from off thy foot; for the place whereon thou standest is holy. And Joshua did so. Shoes is a symbol of activity, speaks of action, momentum. 2. Trust Me. The battle is not yours, but God’s. Slow down, commit your battle to God highlighted Pastor Kong. Mark 5:36 36 As soon as Jesus heard the word that was spoken, he saith unto the ruler of the synagogue, Be not afraid, only believe. The third time when the shoes was taken is in the book of Ruth. Ruth lost her husband and later she fells in love with Boaz. Ruth 4:7, 7 Now this was the manner in former time in Israel concerning redeeming and concerning changing, for to confirm all things; a man plucked off his shoe, and gave it to his neighbour: and this was a testimony in Israel. 8 Therefore the kinsman said unto Boaz, Buy it for thee. So he drew off his shoe. It indicates -I surrender my rights. Pastor Kong then led the people into worship. The Presence of God was beautiful beyond description. People held hands and prayed corporately. The anointing was awesome. The service ended with a beautiful praise song. Praise God for a wonderful time.